The Eliza Johnson First Spouse Gold Coin will feature the wife of the 17th President of the United States, Andrew Johnson. This will begin the fifth year of release for the one-half ounce 24 karat gold coins created to honor the nation’s First Ladies. At the age of 16, Eliza McCardle married Andrew Johnson. The two of them set up a tailor shop in a rented house and worked side by side. During this time, Eliza spent time teaching her husband how to do asthmatic and write, as he had never attended school. When her husband became President, she mad few public appearances due to poor health. She appeared publicly at a reception for Queen Emma of Hawaii and at her husband’s 60th birthday. 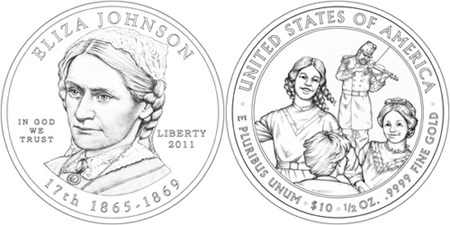 The obverse of the Eliza Johnson Gold Coin features her portrait designed by Joel Iskowitz and sculpted by Don Everhart. The inscriptions include “Eliza Johnson”, “In God We Trust”, “Liberty”, the order of the Presidency “17th”, dates of the term “1865-1869″, and the date of issue. One of her public appearances is represented on the reverse of the coin. Pictured are three children dancing and a fiddler playing at a children’s ball held for Andrew Johnson’s 60th birthday. This image was designed by Gary Whitley and sculpted by Phebe Hemphill. Besides, the Liberty Subset, this is the first instance that the First Lady does not appear on the reverse design of the coin. Reveres inscriptions include “United States or America”, “E Pluribus Unum”, and the face value, weight, and purity of the coin.